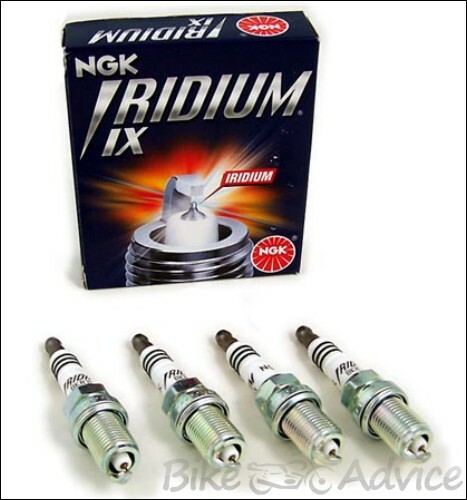 There is no need of Introducing Iridium Spark plug to you guys as many of you would have at least heard of that term and not an alien word in the world of motoring. It became very popular with the foray of performance bikes into the Indian Market. By the turn of the decade, we are going to witness more and more of these Adrenalin spark Injectors. We already saw a quarter liter sports bike in the form of Kawasaki Ninja 250R and also our home grown products like Yamaha R15, Karizma ZMR, Pulsar 220 dtsi, Apache RTR 180 etc. Sadly the lime green baby, ninja was priced on the stratosphere for most of the bikers in India which is still a dream for many. But let’s not worry about that, we have our home grown products which are not far behind and also don’t cost us a bomb. Think sub one lakh for R15 and karizma ZMR is equally justifiable for the amount of technology invested in them. So tinkering on the current offerings can yield us better power or at least feel. Ok, now what’s first? There comes a performance part in the form of spark plug which ignites a bike’s heart. So what can a spark plug do to improve the performance? 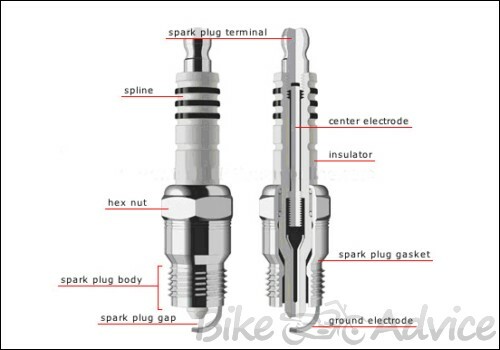 I am going to describe the basics of a spark plug and its working so as to clearly understand its advantages and disadvantages over the normal plug. The main function of a spark plug is to ignite the Air-fuel mixture inside a combustion chamber. The current is supplied to the plug by using an electrical ignition system. The ignition coil will supply the high current needed to the spark plug. When the current reaches the tip of the central electrode, it arcs and joins the base (ground) electrode to form a spark which ignites the mixture. Spark plugs are under constant chemical, thermal, physical, and electrical attack by corrosive gases at 2,000 degrees Celsius, crushing pressures of 2,000 pounds per square inch (PSI) due to the working of the piston, and electrical discharges of up to 20,000 volts. The spark occurs dozens of times per second and over a million times in a day’s worth of riding. The main metal used in ordinary spark plug is nickel-iron or chromium based substance. I am not going to describe about the chemical properties and all because it will turn out to be a chemistry class. Simply put, Iridium is one of the hardest, strongest, and precious and one of the rarest metals found on earth’s crust.Iridium is the best, but too hard to handle. Iridium is 6 times harder, 8 times stronger and can withstand temperatures exceeding 2454° C. Unfortunately, the incredible properties that make it the perfect metal for building spark plugs also made it impossible to work with until now. There was not a welding tool hot enough to melt an iridium electrode tip to a nickel base. That is until DENSO pioneered their patented Laser Welding Process. Improved Firing Performance: To improve firing performance, the contact area between the electrode and the flame nucleus needs to be reduced in size. This is why the electrode was made as fine as possible to a diameter of 0.4mm. Compared to normal Spark Plugs, with a spark gap of 0.8mm, the ignitability limits are better by 2.5. Less metal on the tip allows the spark to expand in a greater area, maximizing firing performance and minimizing voltage requirements. The required voltage in the Iridium plugs is between 3000 volts & 5000 volts that is less than a normal plug. This is due to the ultra-fine 0.4mm diameter ground electrode. Because the required voltage is kept low, Iridium plugs can be used in high performance engines and for high response driving. Smoother Idling: When an engine is idling, firing can become particularly bad. Because Iridium Power plugs have a low required voltage and high ignitability, sparking continues to work properly during idling. Whereas normal plugs have highly variable rpm counts, Iridium Power plugs maintain very smooth idling. Also, because combustion is good, the explosive energy raises the rpm count. Improved Engine Performance: Iridium Power spark plugs enhance the performance of an engine. Acceleration is improved when compared against normal spark plugs. Decreased Fuel Consumption: When Iridium Power spark plugs are used, accidental fire and misfiring rarely occurs under various driving conditions. Therefore, combustion is extremely good. In turn, a healthy engine can be maintained and fuel consumption improved. So why not use an Iridium plug? (Disadvantages): We can’t properly say a disadvantage for using an iridium plug. But commonly Iridium plugs are used where high efficiency or high tuning is needed. In most of the other cases, normal spark plug is enough. It is mainly used in high performance engines like our Yamaha R15 or the incredible tourer’s the Karizma and the Pulsar 220’s. I said this because one of my friends came and asked me whether he can fit an Iridium spark plug to his Hero Honda splendor. I said yes, it can be fitted to any vehicle provided the manufacturer has the specified model. But fitting it to a small engined vehicle like my friend’s does not completely justify the amount we are investing for getting an Iridium plug and furthermore, the daily commuter is not going to gain any noticeable improvements. Coming back to the fitments of Iridium plugs to our home grown performance bikes. It’s a common thing now a day to fit a K&N free flow air filter or of any type of performance filters to our bikes. People are mistaken by the fact that they are really gaining performance advantage by simply retro fitting it in place of normal air filter. The only true improvement gaining from this modification is better throttle feel due to leaner mixture provided by the performance filters and of course the trademark intake roar that can be heard in every corner of our country. One way is to re-jet the carburetor. But if it’s a fuel injected vehicle, that possibility is also null. Either they have to replace the ECU or remap it in some way provided it has a closed loop system. Both the modification will turn out to be very expensive, delicate, time consuming and lot of hard work that involves excessive R&D. The simplest way is to use an Iridium plug which will provide a much better spark. After all it’s easier to burn fuel than air. The more air, less fuel mixture can be effectively burned by using Iridium plug provided if one wants to run the engine lean or just retrofit the Iridiums without any additional modifications. Thus attaining a reasonable difference in throttle response that infact becomes crisp. More Modifications: Do u people want to pull out more juice out of your already etched ride? Here comes the high performance ignition wire. These are the low resistance super conductor cables (50 ohms resistance). The original spark plug cable should be removed and this cable is to be connected to spark plug from the ignition unit. When coupled it with the Iridium plugs, the current produced by the ignition unit is carried to the spark plug without any loss. So Voila…again some juice. These high performance ignition wires are manufactured by some well known firms like MSD and Spitfire which convinces us to at least trust them by not harming the engine. So get ready for an exhilarating experience, save some money and start procuring things!